This Weigand mount is a lightweight, versatile scope mount that easily converts the Buck Mark from open sights to a scope ready pistol, all with no permanent modifications made to the pistol. Simply remove the factory sight rail and install with the Weigand mount with the screws provided. The mount accepts Weaver-style rings and accessories. Mount is 6-1/4" long and weighs 1.7 ounces. Avalaible in either a Matte Black or Matte Silver anodized finish. Pistol shown not included. 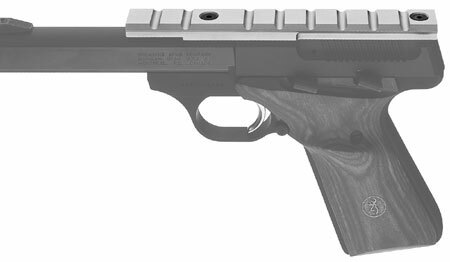 This is much wider than what I need for my BSA Red Dot.